Swami Vivekananda at Mahasamadhi of Ramakrishna Paramhansa. Feet towards East and Head towards West. Mahasamadhi happens during meditation through one own will and the Yogi leaves the body behind.Sunlight shines on the faces of disciples around.Sunday, August 15, 1886. The Master’s pulse became irregular. 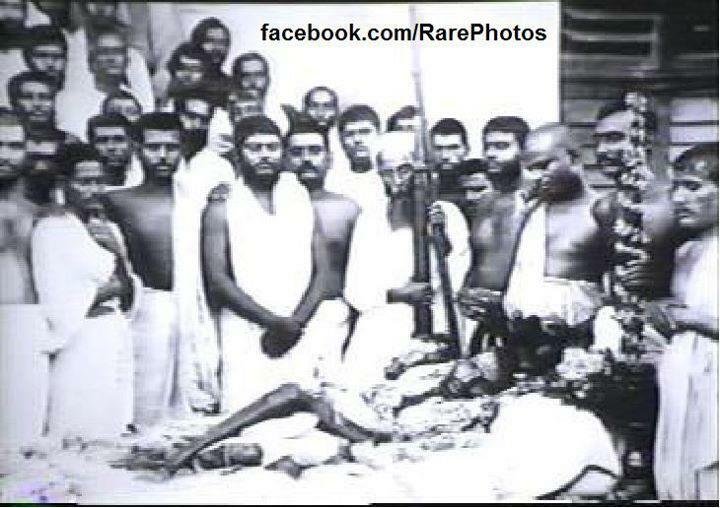 The devotees stood by the bedside. Toward dusk Sri Ramakrishna had difficulty in breathing. A short time afterwards he complained of hunger. A little liquid food was put into his mouth; some of it he swallowed, and the rest ran over his chin. Two attendants began to fan him. All at once he went into samadhi of a rather unusual type. The body became stiff. Sashi burst into tears. But after midnight the Master revived. He was now very hungry and helped himself to a bowl of porridge. He said he was strong again. He sat up against five or six pillows, which were supported by the body of Sashi, who was fanning him. Narendra took his feet on his lap and began to rub them. Again and again the Master repeated to him, “Take care of these boys.” Then he asked to lie down. Three times in ringing tone’s he cried the name of Kali, his life’s Beloved, and lay back. At two minutes past one there was a low sound in his throat and he fell a little to one side. A thrill passed over his body. His hair stood on end. His eyes became fixed on the tip of his nose. His face was lighted with a smile. The final ecstasy began. It was mahasamadhi, total absorption, from which his mind never returned. Narendra, unable to bear it, ran downstairs. Dr. Sarkar arrived the following noon and pronounced that life had departed not more than half an hour before. At five o’clock the Masters body was brought downstairs, laid on a cot, dressed in ochre clothes, and decorated with sandal-paste and flowers. A procession was formed. The passers-by wept as the body was taken to the cremation ground at the Baranagore Ghat on the Ganges.All the Ashes were buried in important locations for spiritual energy to spread in masses. 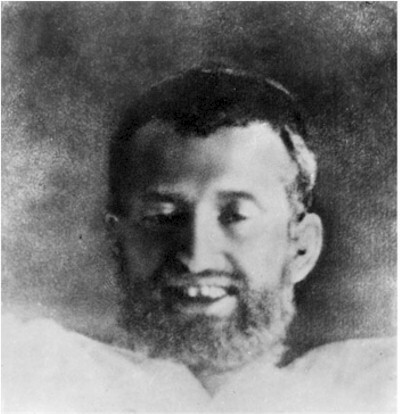 Shri Ramakrishna was every where from then onwards, and not limited to flesh and bones. He had victory over death and became more nearer to every person in distress in the world. Jai Shri Ramakrishna !!! Jai Guru !!! Jai Sri Ramkrishna Paramahansadev…………..grateful for ever !! Magha Samadhi of Ghagoban Sri Ramakrishna is the rarest picture that the world has ever witnessed .In the picture the Unconscious Brahman and the Avatar of the avatars reflect as the unified whole .